MediaProxy is a media relay for RTP/RTCP streams over UDP, that works in tandem with OpenSIPS to provide NAT traversal capability for media streams from SIP user agents located behind NAT. This software is licensed according to the GPL version 2. 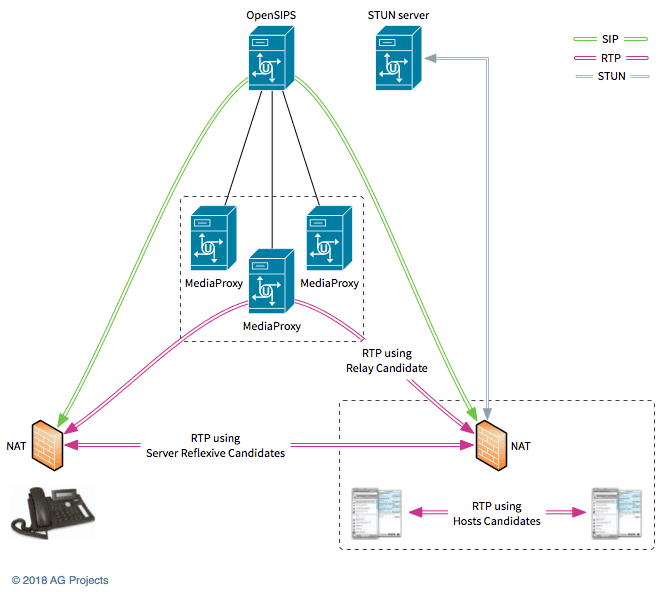 MediaProxy supports ICE negotiation by behaving like a TURN relay candidate and the policy can be controlled from OpenSIPS configuration. It is recommended to run the relay component natively on the host operating system and not in a virtual environment. For embedding the software in proprietary hardware, you may contact AG Projects for an alternative license. MediaProxy 2.0 is the second generation media relay application, which is based on a completely new design that allows for major improvements in areas such as scalability and security (communication between relay and dispatcher is encrypted). New features have been added to support ICE (acts like a TURN relay) and call flows related to user mobility and fax transmission.